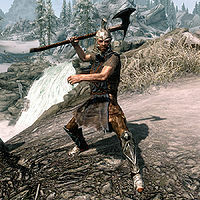 The Scavenger is a Nord bandit who is randomly encountered in the wilderness with the corpses of three Imperial soldiers and three Stormcloak soldiers. One of each type is naked, and the scavenger is in the process of looting another soldier. He wears a Stormcloak cuirass with Imperial boots and an Imperial officer's helmet. He carries an Imperial light shield, an iron battleaxe, an Imperial bow, and four steel arrows. "I'm not kidding. I'll hurt you!" This page was last modified on 20 March 2013, at 05:12.